Training youth leaders has been part of Thrive’s vision since the start. Alongside building confidence in youth work, enabling leaders to have the necessary skills to lead effectively has been essential. Over the years we have offered training in a variety of areas including building an effective youth leadership team, growing a thriving youth group, how to have meaningful conversations with a young person and building a vision and strategy for youth ministry. Sometimes training has been open to all local leaders and sometimes delivered to one particular church. We offer training on whatever topics churches are most needing to be covered. Our experience shows that when we raise a subject with a group of leaders, there is always loads of discussion and these conversations are often the most helpful element of the training. It’s a real privilege to be able to sit with a team of leaders and to offer inspiration to help them be more effective in reaching out and discipling young people. 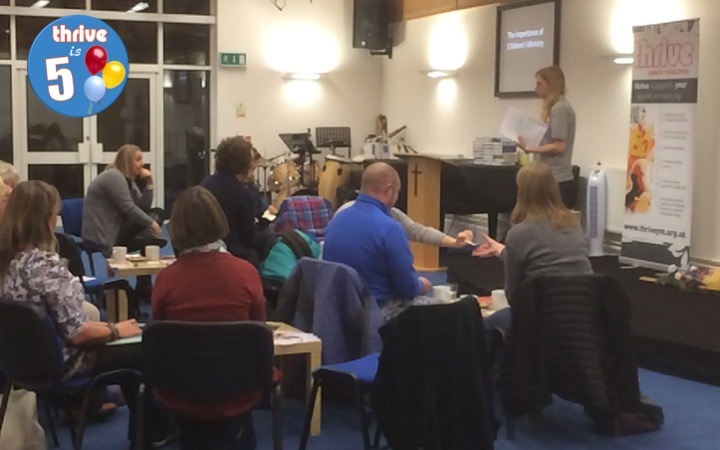 “I have been on a few training courses and I have to say this was one of the best and so well thought through and well organised, the material shared was all relevant and the way it was presented was understandable and easy for any size church to pick up, with excellent new ideas.” – participant at a Thrive training course. Since taking Fiona onto the team, our training has expanded into our work with children’s leaders as well. 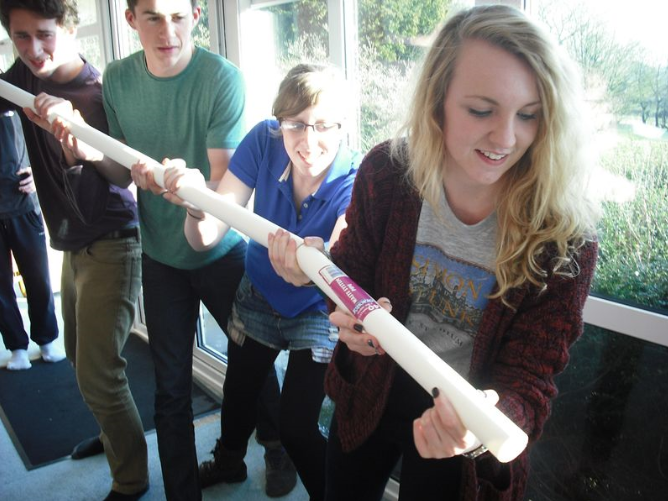 In 2017, she has created a varied training programme covering issues such as how to deliver engaging assemblies and making the most of Messy Church. Sometimes we have worked with our partner, Scripture Union, to deliver training. We did this to promote the Sticky Faith research material, revealing why so many young people grow up within the church but walk away from faith as an adult. Scripture Union’s Steve Hutchinson joined Fiona to deliver a very engaging training evening on how to run a successful holiday club. Fiona provided lots of ideas and inspiration, whilst Steve shared how SU has been committed for many years to enabling effective holiday clubs to take place. The holiday clubs represented had a combined total of over 600 children, so the opportunity for influence was vast. That’s one of the deep privileges of Thrive. Whilst we work with relatively few people, the number of people that each leader works with soon adds up to something very significant. In 2016 alone, we calculated that we worked with over 500 leaders, from many different churches, but the total number of children and young people they lead will be far greater. Hear how Children’s Worker, Ruth Powell, benefited from attending a holiday club training event by watching the video below. Resolution is an annual spiritual retreat Thrive runs for employed youth and children’s workers, as well as schools workers. Having time to invest in themselves is an essential part of keeping a leader healthy, and yet it is so easy to neglect this need. Each year, we take a group of leaders away for 24 hours and give them space to connect with their Heavenly Father, to seek his guidance as well as spending time connecting with each other and encouraging them for the journey of leadership. It is always a privilege to lead Resolution and to have the opportunity to speak directly into the lives of these leaders, who are committed to seeing the next generation of young people come to know Jesus for themselves. Looking to the future, we want to offer more training in addition to offering spiritual retreats for volunteers as well as those who are employed. Raising an army of youth and children’s leaders who are passionate and also have the necessary skills is a key goal for Thrive, if we are to see our vision realised of every church having a thriving youth ministry.